Today’s DIY recipe is simple and effective, yet I hesitated to write this post, or more like photograph this post. When it comes to food, there are so many fun textures and colors to style and photograph, particularly when it comes to real food. But homemade floor cleaner? There are only so many ways to photograph a mop, bucket, and three simple ingredients. While the photos may not be as glamorous (hello white bucket and mop), I can guarantee you that today’s cleaning “recipe” is a keeper. A recipe that’s worth sharing despite the photography challenge. 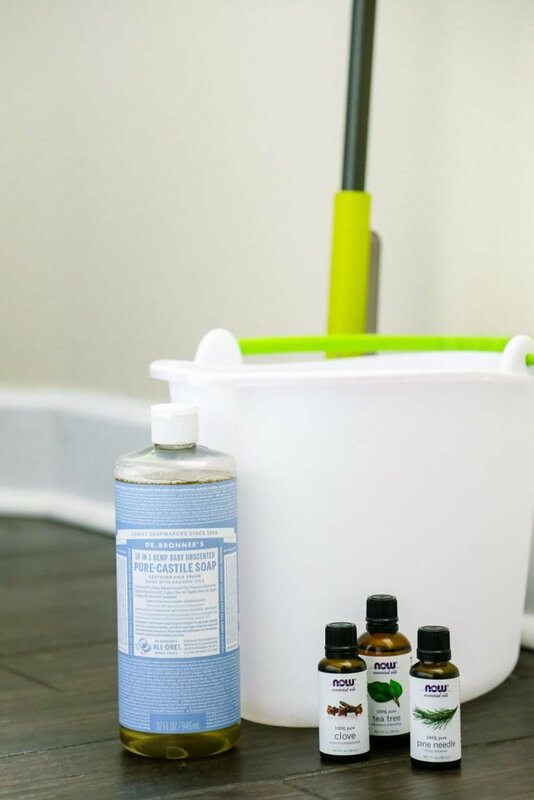 At the end of last year, I shared a recipe for homemade floor cleaner, which I use frequently to clean our tile floor. If we take a look further back into the blog archives, I’ve also shared a floor cleaner made with similar ingredients in a make-ahead wipe form. Both recipes share a common ingredient: vinegar. Vinegar has a reputation for being the “do it all” cleaner, and it’s for a good reason. Vinegar may be used to soften clothes in the washing machine and remove dingy odors. Vinegar may also be used to disinfectant toilet bowls and sinks, clean hard surfaces and windows, and wash floors. I think vinegar lives up to its “do it all” cleaning reputation pretty well. 1. The vinegar scent is quite strong. Yes, the vinegar scent is nothing compared to smelling bleach or a dirty dog (because there happens to be one sitting under my feet), but it is quite strong. If you’ve ever opened a bottle of vinegar or sprayed down your counter with diluted vinegar, then I’m sure you know the scent I’m talking about. I know some folks choose not to clean with vinegar due to the odor. Vinegar isn’t toxic and its odor is completely safe and usually dissipates after a few minutes, but if it bothers you, cleaning your house with vinegar won’t be enjoyable. 2. Vinegar isn’t safe to use on all surfaces. It really bothers me when I see recipes online that include vinegar and claim to “clean everything,” yet I know from my own research and experience that the cleaner may actually destroy granite or marble (just one example). Vinegar is an amazing natural ingredient, but just because something is natural doesn’t mean it should be haphazardly sprayed on every surface. Vinegar is an acid, which means it may actually damage some fragile surfaces, like marble and granite. I really don’t mean to shatter anyone’s vinegar bubble today. I believe it’s important to always think about the products we use in our home (or on our bodies, or in our bodies), even if it’s a natural product. 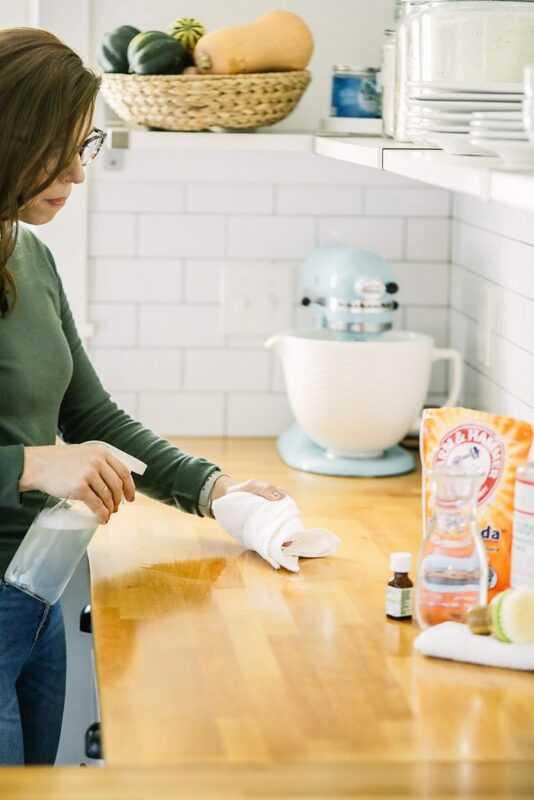 I personally love cleaning with vinegar, and I use vinegar quite frequently to wipe down our counters, clean the kids’ toys, disinfect our toilets, and wash our floors, but I know there’s more than one natural way to get a house clean. Sorry, Vinegar, you might just have some cleaning competition. If you have a house with hard floors and you can’t use vinegar for cleaning, or you don’t want to use vinegar due to the odor issue, let me introduce you to vinegar’s competition: castile soap. Castile soap and vinegar don’t get along, and they can’t be mixed to form one cleaner, but they can be used separately and are both amazing ingredients to add to a cleaning toolkit. Just like vinegar, castile soap also has many different uses: washing the dirty dog I referenced earlier, cleaning a human’s body (too), cleaning a hard surface, cleaning clothes via a homemade laundry soap (both dry and liquid soaps), dusting surfaces, and even washing hard floors. What is this magical substance known as castile soap? Castile soap is a concentrated vegetable-based soap made of ingredients you can actually pronounce. This soap is gentle on the skin and effective in the fight against dirt, grease, and unwanted germs. Castile soap has a pH around 8.9, and 7 is considered neutral. This mean castile soap doesn’t have the acidic “harshness” of vinegar, making it ideal for more fragile surfaces. Is castile soap the natural cleaning answer for all surfaces? To be honest, I’m hesitant to say that one ingredient or product will work for every surface (or person), but I will say that I believe castile soap is a good alternative if you don’t want to (or can’t) use vinegar on your hard floors. 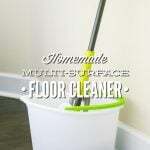 I hope this floor cleaner recipe provides you with one more option to clean your home, naturally. 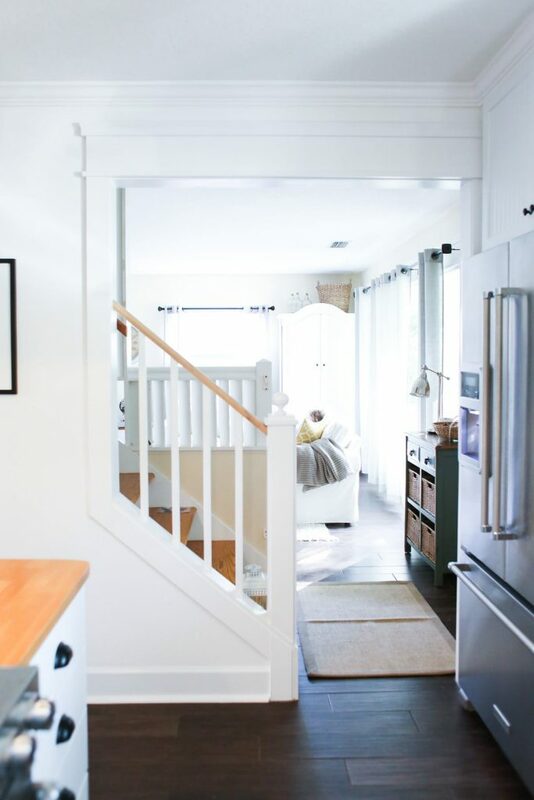 For me, it’s wonderful to know that I have many different choices for what I can use to clean my home, using the same ingredients in my natural cleaning toolkit in different ways. Next week, we’re going add this recipe to a helpful list of natural and simple products that may be used to clean an entire home, from the bathroom to the floor to the kitchen. An easy to make floor cleaner without vinegar. 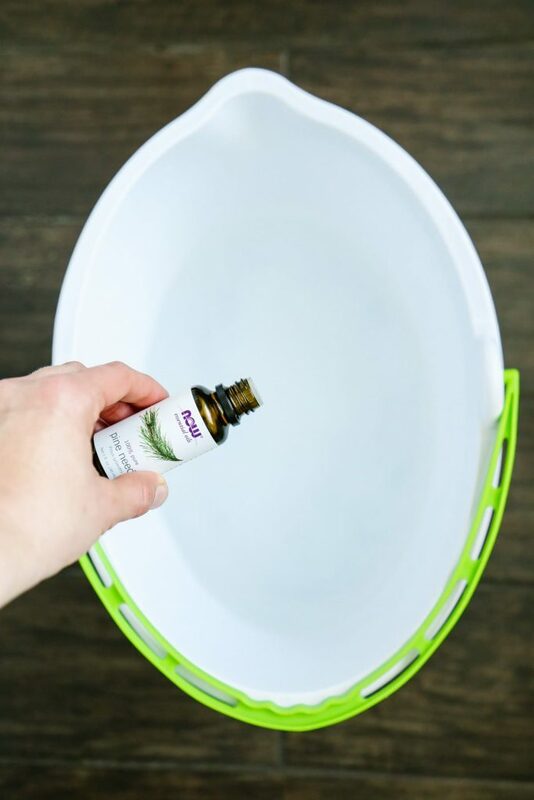 2 tablespoons castile soap or less, or Sal Suds, see note under "Ingredient Notes"
Add the hot water to a bucket, then the liquid castile soap and essential oil. Gently stir the ingredients together (you don’t want a ton of bubbles). To Use: Dip a mop into the solution, then mop the floor. Do not saturate the floor while mopping. 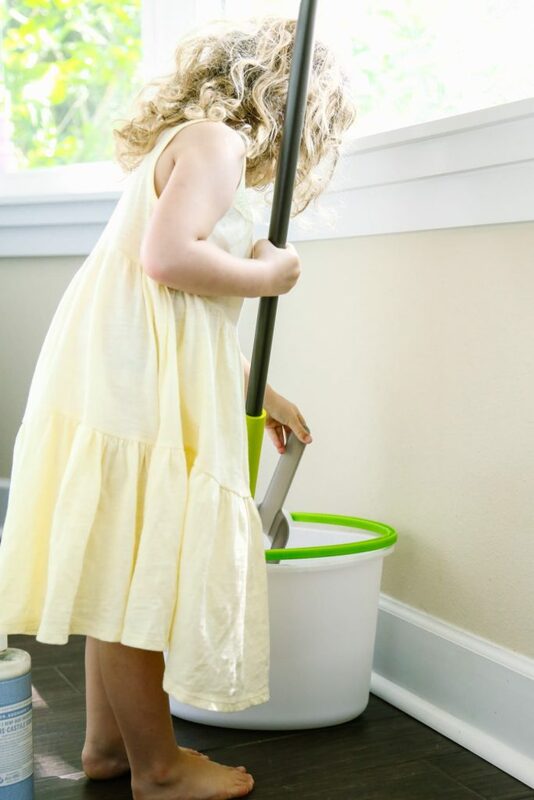 Once the floor is clean, discard the dirty water and fill the bucket with 2 more gallons of hot water (no soap this time), wipe the floor with the mop and clean water. This solution may be safe for sealed wood floors and other common household surfaces (I use this on our tile) since the pH of castile soap is around 8.9 (a pH of 7 is neutral). Always spot test first (a couple of times) before applying any cleaning product to a full surface! I’ve also learned, from some major trial and error, that’s important to talk to a floor expert about the best way to clean a particular floor (what kind of ingredients/methods to avoid in particular), since there are so many different types of floor surfaces today. Any castile soap variety will work. I just happen to have unscented castile soap on hand as I was photographing this post. I’ve made this floor cleaner with tea tree, peppermint, lavender, and orange castile soap. I prefer to use 2 tablespoons of castile soap to 2 gallons of hot water. If you feel this ratio is too soapy, then reduce the soap ratio to 1 tablespoon of castile soap to 2 gallons of hot water. If your test spot has a soapy residue, then you know you’ll want to tweak the ratio. If you’re still not happy with castile soap on your floor, then I recommend using Sal Suds, which is a heavy-duty (safe) detergent. You’ll only need about 4 drops of Sal Suds versus 3 tablespoons. I’ve enjoyed all your cleaning tips/posts, Kristin. Thanks for keeping them basic/useful vs. trying to do something new/fancy! If you’re up for requests, I’d love to see a post about a good way to clean an oven. I’ve tried all sorts of natural things, and mine still looks really gross. (And baking soda is SO hard to rinse off… even with vinegar! And, how do you keep it from falling into all the cracks and crevices of your stove (mine’s gas)? Am I missing something?!) My mom uses that crazy-toxic oven cleaner stuff… and as much as I hate the fumes, I get oven-envy whenever I go to her place and see inside / turn it on, and don’t smell any burning food. I know yours is in constant use. How do you keep it clean? And, how clean does it get? And, on an unrelated topic, I’d also love a post on whether you give your kids any vitamins / supplements… and why you don’t if you don’t. I get overwhelmed by the various opinions on the topic, and find it frustrating that all kids’ vitamins contain dyes and sweeteners I wouldn’t otherwise feed them. We’re in Canada, and it seems most people agree we need Vitamin D because of the winter (know you don’t have that problem!). Certainly, my levels are always low whenever I’ve had blood work (iron, too). We eat a varied diet of real foods, so I wonder if there is just a reality to which food isn’t as nutritionally dense as it once was, so supplements really are necessary now? Anyway, would love your thoughts, if you’re up for it! I’m so glad you’re enjoying the simple recipes. My oven is dirty 99.9% of the time, because my oven is used so much. It’s almost more of a commercial oven at this point, along with my kitchen, due to the amount of recipe testing/photography work that comes out of it on a daily basis (freelancing, the blog, etc.). I try to clean it at least every three months, just to keep it from getting so bad that I don’t want to open the door when guests come over, lol ;). A baking soda paste has been the best solution for my oven since it’s tough on grease. My recipe is in my cleaning book. I’d be happy to email you the recipe. I’ve tried straight vinegar before (since I have good success with it cutting the grease on the stove-top), but I haven’t had much success with it as the main oven cleaner. I will say, the baking soda paste can be tricky to completely clean off, and it does require more cleaning time (washing it off). I use an old toothbrush and water to clean out the tiny little areas in the oven. We have gas, too. I love requests! I want to share recipes and content that I’m currently loving, and find solutions that readers currently need, too. Thank you for the great suggestion. We live in Florida, so I don’t supplement with vitamin D. I’m going to ask Renee, a Live Simply contributor, who has a book about kids and real food coming out in the fall, if she’ll tackle this subject. She also lives in Michigan. She’s my go-to personal resource for all-things kids and real food. Question: do things burn in your oven between cleanings? I try to clean ours fairly regularly, because if I don’t right after I cook chicken or something, it always seems that the next time I use it, the smoke alarm goes off. Thanks for considering my vitamins and supplements question! Vinegar is really great to use, just you have to be careful where and how. Some people don’t like to use it but I have to say that it’s better than the chemical stuff! Hey Lisa, I’m glad you’ve had such great success with vinegar! Thanks for sharing. Love your blog! I’m somewhat new to the idea of all natural inside and out, but after recently buying a nutritional cleanse program, my attention has been drawn towards reading tons of research and sites, including yours. Baby steps…..With that said, years ago I was involved in a new product invention that never made it to the market shelves, but is still one of my absolute favorite cleaning tools. It’s merely a “cloth” that offers chemical free cleaning like you have never seen. I used it yesterday with a bucket of plain water to literally detail my car top to bottom. It’s amazing on glass/mirrors, yet very effective on getting stains out of carpet. With simply wetting it with water, it becomes one of the best cleaning agents out there, yet could be used in the bath as well. I’d like to send you one to try and see what you think. I have a large supply of them that I’m fine with having my own personal lifetime supply, however, I think the time has come to allow some other health conscious mommies out there experience the magic. I’m a mommy of 2, RN by education, currently moved to NC and enjoying being a housewife. If you would like a free cloth to add to your cleaning regime, send me an address and I will slip one in the mail to you! Hey Susan, Thank you for sharing! I’m always up for trying new green cleaning products. I’ll email you. Can I just clean the floor (with the homemade floor cleaner without vinegar) and not doing the step 2 (cleaning with hot water).? Hey Kim, You can definitely give it a try! I personally like the results when using hot water for a second wash.
Hi: I just discovered your blog – love it. I make a lot of my own cleaners and though vinegar is quite odiferous, it does fade pretty quickly – I use it a lot. Here’s my problem: I have a ring around my toilet that I just cannot get rid of. I’ve tried everything; baking soda and vinegar, commercial toilet bowl cleaners, CLR, even a pumice stone won’t budge this. You’re my last hope before I resign myself to getting a new toilet (sigh). first time user on my floors…looking for right way to clean LVT with Castile soap. Hey Mel, Is LVT = vinyl tile? I would think castile would work for that, but I could be wrong. I would call the manufacturer and ask what they recommend for cleaning. 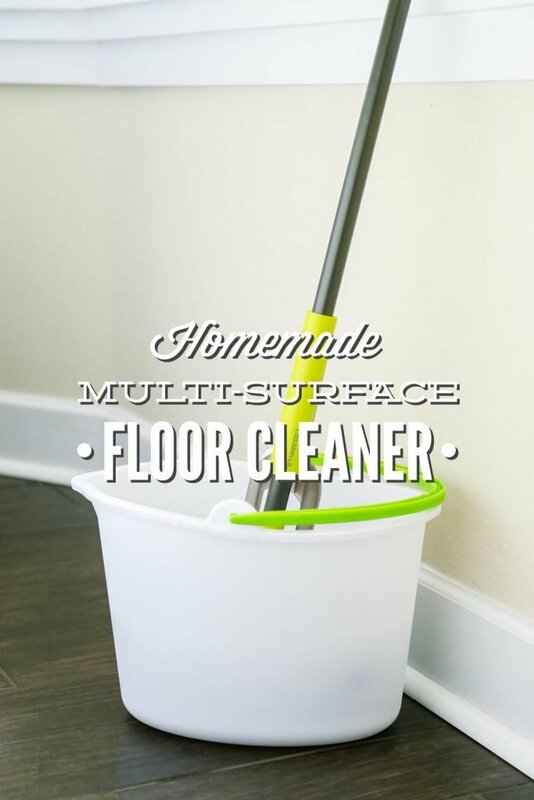 I will definitely give this homemade floor cleaner a try. Thank you. Please mention that when using any essential oil that if you have pets to check with a veterinarian before using! Most essential oils are toxic to animals. Thanks for mentioning this, Arlene. As you mentioned, it’s important for people to do their research and be smart about anything used in their home. Hi! Wondering if this keeps well in a sealed container? Know how long? Any info on how long it would keep…? Hey Beth, This will keep for about 3 weeks, if using distilled water.